Daniel Day-Lewis in "Dorf: The Movie"
The itch to remonstrate any Paul Thomas Anderson film as pretentious is not without justification. Remember the frog-shower in Magnolia? Yep, that was him. But, from Hard Eight to Boogie Nights to Punch-Drunk Love, Anderson’s filmography has always been stamped with the brand “flawed masterpiece,” works that are simultaneously brilliant, indulgent, and infuriating. These descriptors also apply to There Will Be Blood, and they are qualities that Anderson shares – perhaps not altogether coincidentally – with its larger-than-life protagonist, Daniel Plainview. At once both a riveting character study and a scorching metaphor, Anderson’s adaptation of Upton Sinclair’s 1927 novel Oil! is at least equally influenced by the cinema that comprised the syllabus for Anderson’s cinematic self-education – Giant, Citizen Kane, even the three-act narrative structure of Kubrick’s 2001 (headlined by a half-hour opening chapter sans dialogue that could well be called “The Dawn of Daniel”). It is The Treasure of the Sierra Madre had Bogie’s Fred Dobbs been the one to emerge from the hills with all the gold. No film over the past year has haunted me more departing the theater, and no film has grown in my esteem the longer I have pondered it. Within Anderson and cinematographer Robert Elswit’s epic stereogram is a Faustian fever dream that deconstructs both the Horatio Alger mythos and the American ethos. The story of Plainview – whom the luminous Daniel Day-Lewis instills with an almost reptilian gait and a melodious baritone mimicking John Huston – reflects much that is admirable and reproving in the American experience. A turn-of-the-century Texas prospector who crawls miles of rugged terrain after shattering his leg just to stake claim to a silver mine, Plainview embodies the hardscrabble spirit that legend tells us built this country. His later trek to California in search of an oil-rich expanse and financial glory mirrors our nation’s western expansion. Once there, Plainview preys on the want of cash-strapped homesteaders to acquire great swaths of land on which to build his derricks and fiscal empire. Yet, even as his coffers overflow, Plainview’s descent into personal decay is precipitous. The more economic success he attains, the more he cordons himself from those around him, even his deaf adopted son H.W. (Dillon Freasier, then Russell Harvard as an adult). Accompanied by Jonny Greenwood’s ethereal score, Plainview develops into a fistula protruding from capitalism’s seamy underbelly: shrewd, diabolical, and cunning…everything we continue to admire and even demand from our corporate and political leaders. Anderson’s most devious trick is triggering the faint notion that even after all Plainview’s foibles and personal tragedies are laid bare, many of us would still trade places with him if his mansion and money came with the deal. Deciphering motives behind Plainview’s madness is a thorny matter, and it is one There Will Be Blood’s starkest shortcomings. Beyond the general dislike for his fellow man Plainview confesses (to a man he later murders), his psychosis seems driven primarily by a running to-and-fro with local preacher Eli Sunday (Paul Dano). Originally uneasy business partners, their relationship devolves into a series of indignities and reprisals, notably duel violent baptisms each inflicts upon the other, one by oil and the other by water. Plainview’s inability to submit to any authority beyond his self-interest, much less one that requires him to confess and confront his wickedness, illuminates There Will Be Blood’s driving conflict and clarifies its cataclysmic (and undoubtedly divisive) climax. 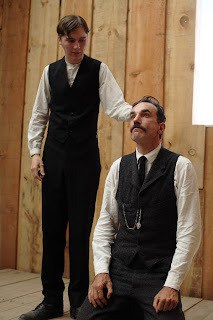 Charles Foster Kane dies pining for his Rosebud; Daniel Plainview’s perverse redemption flows from obliterating his own.